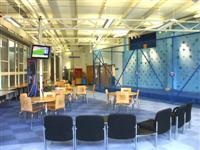 Services / facilities within the building include a swimming pool, sports hall, climbing wall and a meeting room. 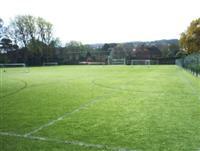 Services / facilities within the grounds include artificial pitches. Related link Hillbrow and Welkin Campus. This venue is situated in the Hillbrow Campus. The nearest mainline station is Eastbourne. 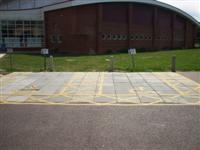 The dimensions of the designated parking bay(s) are 500cm x 350cm (16ft 5in x 11ft 6in). 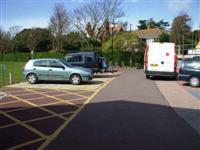 The furthest designated bay is 29m (32yd) from the main entrance. The door opening is 84cm (2ft 9in) wide. The automatic doors are push pad operated and open towards you. 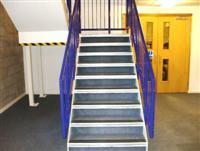 There are also double, heavy, manual doors, 170cm wide, located next to the automatic doors. Music is played in the seating area by reception. 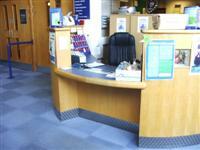 Photograph 1 shows the seating area located next to the reception desk. 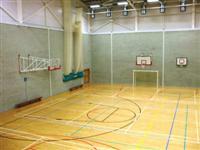 Photograph 2 shows the main sports hall. 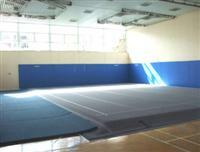 You are on Level Change (Middle Gymnasium). Skip to the next section. The ramp or slope is located leading up to the sprung floor. The lift is located to the left of the reception desk, past the stairs. The dimensions of the lift are 92cm x 149cm (3ft 0in x 4ft 11in). The door leading to the lift on the ground floor is push pad operated. 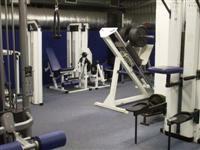 The fitness suite is located on the 1st floor. 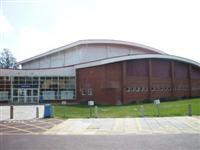 The fitness suite is 29m (32yd) from the main entrance. 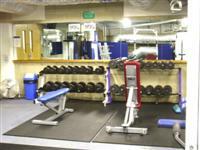 Equipment suitable for mobility or sensory impaired users includes free weights. 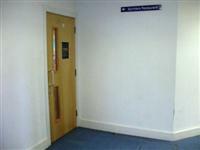 The standard changing rooms are located along the corridor next to the reception desk. 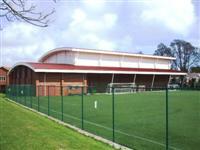 The standard changing room is 24m (26yd) from the main entrance. The standard changing room is 18m (20yd) from the reception desk. 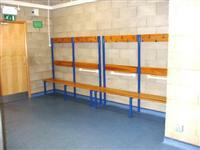 The standard changing room is 12m (13yd) from the Sports Hall. 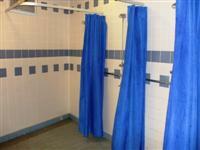 The showers are located within the standard changing rooms. You are on Standard Shower (Dry Side). Skip to the next section. The showers are located in the standard changing rooms. 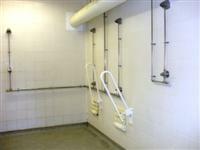 The accessible toilet is located in the corridor leading to the outdoor pitches, between the male and female changing rooms. The dimensions of the accessible toilet are 180cm x 192cm (5ft 11in x 6ft 4in). 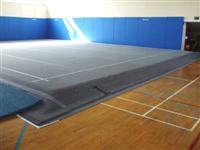 The lateral transfer space is 149cm (4ft 11in). You are on Standard Toilet(s) (Dry Side). Skip to the next section. 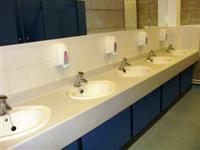 The female and male toilets are located within the standard changing rooms. The accessible changing rooms are located at the far end of the standard changing rooms. 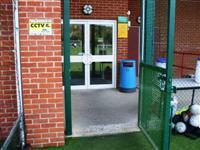 The accessible changing room is 53m (58yd) from the main entrance. The accessible changing room is 22m (24yd) from the Swimming Pool. 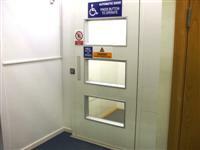 The accessible changing room is 52m (57yd) from the reception desk. The dimensions of the accessible changing room are 183cm x 282cm (6ft 0in x 9ft 3in). 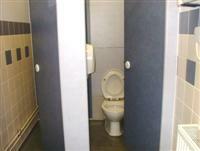 Other facilities available are an adapted toilet. 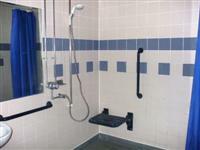 The showers are located within the adapted changing room. The standard changing rooms are located at the far end of the pool from the entrance. The standard changing room is 43m (47yd) from the main entrance. The standard changing room is 42m (46yd) from the reception desk. 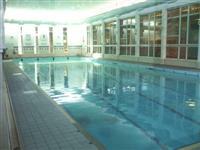 The standard changing room is 27m (30yd) from the Swimming Pool. You are on Standard Shower (Wet Side). Skip to the next section. 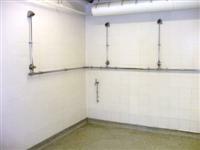 The showers are located leading from the changing rooms to the Pool. 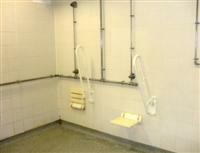 There are also separate male and female shower rooms located nearer the standard changing rooms. The accessible toilet is 53m (58yd) from the main entrance. The accessible toilet is located within the adapted changing room. The dimensions of the accessible toilet are 183cm x 282cm (6ft 0in x 9ft 3in). The toilet roll holder is 101cm (3ft 4in) high. 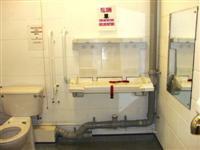 There are also adapted toilets available in the separate male and female shower rooms. The female toilet has the transfer space on the right. You are on Standard Toilet(s) (Wet Side). Skip to the next section. The female and male toilets are 46m (50yd) from the main entrance. There is not a wet side chair available. There is not a hoist for wheelchair users to access the water. The photographs show the access to the artificial pitches from the Centre via double, heavy doors, 152cm wide, and a single gate, 115cm wide. The photograph shows the access to Sprinters Restaurant from the centre via a single, heavy door, 75cm wide which opens towards you.